Find a lower price we will BEAT IT!!! **Buy Direct and $ave! Our magnet will hold up 3-5 years outdoors in the sun and rain. Use Markers, Acrylic Paint or Krylon Spray Paint to decorate. Thin Magnet (0.020") is typically used for fridge magnets. Medium Thickness (0.030") for vehicle signs. 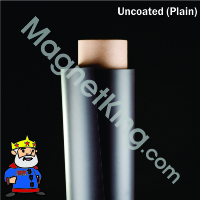 Thick Magnet (0.060") is best for industrial applications. Thin Magnet 1/64 inch thick (0.020") is typically used for fridge magnets. 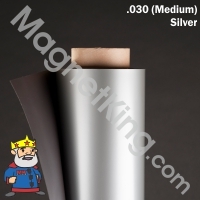 Medium Magnet 1/32 inch thick (0.030") for vehicle signs and most craft projects. 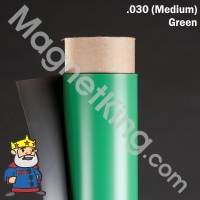 Thick Magnet 1/16 inch thick (0.060") is best for industrial applications. 30+ Colors to choose from!!! Thin Magnet (0.020") is typically used for fridge magnets. Medium Thickness (0.030") for vehicle signs. Rolls/Strips can be cut to any length. Add $20.00 set up fee plus $5 per roll and 5 cents per cut, for rolls up to 3" wide, sizes up to 3"x12". 4" strips are 15 cents per cut plus the standard set up fees. Custom roll widths, die and kiss cutting, fabricating and packaging available by quote. 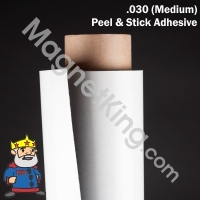 Great when used with Magnetic Marker Boards or apply to any metal surface for changeable labels. Use only dry erase markers. Material looks like Magnetic Sheeting but is not Magnetic, it is Magnet Receptive like Steel. This magnet is made for indoor use - You must laminate it for outdoor use. Please note - regular inkjets will fade in 1 month outdoors on this or any other material. White 0.030 medium magnetic sign blanks cut to shape - perfect for vinyl sign cutters. Peel-n-stick, Dry Erase, Colors and other thicknesses also available. To view detailed pricing for each size click on the images below. 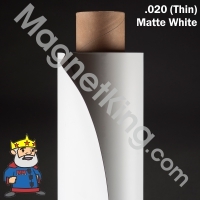 White 0.030 magnetic sign blanks cut to shape - perfect for vinyl sign cutters. EPS Files are available for download with your order. Special Colors, Custom Shapes and larger quantities are available. 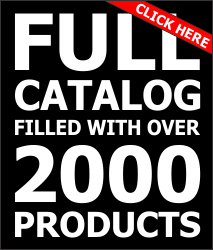 To view prices for larger quantities or additional materials and thicknesses CLICK HERE . Insurance & Appraiser Claims Each Arrow is 2in. by 5in. Makes room appear dark and empty. Store flat on file cabinet or metal door when not in use. Lockdown Door Jamb Magnets - Place these magnets on your door jamb for increased safety. Removes quickly in emergency event. Can be printed with your message. Magnets can be cut to exact size with scissors or razor knife. Call for custom sizes and printing options. Flexible Magnetic Sheeting is best suited for adhering labels, signs and decorations to metal surfaces. Flexible Magnets have much less magnetic pull than Rigid Magnets (search for Neodymium & Ceramic magnets). Flexible Magnets are much less expensive than Rigid Magnets. Magnetic Strength varies greatly depending on the distance of the magnet to the metal. When possible, place the magnet directly on the metal surface. Affix the item to be held to the face of the magnet rather than under the magnet. 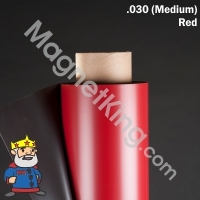 For vehicle purposes, use 0.030 magnet - the thicker 0.060 catches more wind and is less effective even though it has higher magnetic strength. The following test results are based on 1 sheet of magnet 2x3.5 inches (business card size) placed on a factory painted steel filing cabinet. Your results my vary. We accept Checks, Money Orders, PayPal, Visa, MasterCard, American Express and Discover. P.O's from Government Agencies and Fortune 500 Companies. Email us for large quantity orders, custom fabricating, imprinting, laminating and die cutting quotes. 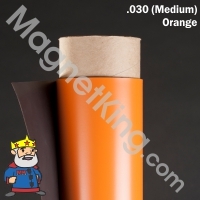 ** MagnetKing will beat any american competitors price for the exact same product/material.Simply email us with a copy of the competitors quote or the link to view it online and we will beat it. *Orders that are received before 12pm est generally ship the same day, same day shipping is not guaranteed unless prior arrangements have been made. If you are in need of the item/order in a hurry please contact us to determine when it will ship.